Sights, sounds and the sense of an impending summer in the UK 2005. Originally uploaded by Dazza Waters. Out of London, laden with food, we made our way to Lewes, west Sussex, where I had lived for a year as a student. It's a beautiful old market town, with plenty of antique shops and loads of character. We wandered past my old student house - a lovely terrace, which I shared with 3 friends. 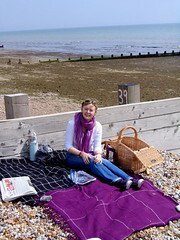 We then headed to Ferring, just outside Worthing and sat on a lovely pebble beach in the sun, stuffing ourselves silly! Dozing in the sun with full bellies. Lovely.